The countdown has begun to our next free ACS Program-in-a-Box! It’s the International Year of the Periodic Table! One-hundred and fifty years ago, Dmitri Mendeleev first presented his periodic system to the Russian Chemical Society, forever shaping the way we look at the elements. Join hundreds of groups from around the U.S. and the globe for this live celebration of one of chemistry’s greatest achievements! 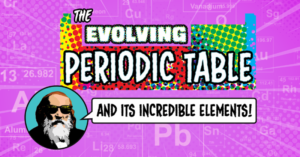 Explore the early efforts of scientists to organize the elements, be the first online to answer elemental “Table Trivia,” and learn how the Table continues to grow with the addition of new super heavy elements. Join us in the MESA Center at the College of Alameda Science Annex for fun and refreshments at 3:45 PM, followed by the ACS live webinar at 4 PM, complete with Periodic Table trivia and prizes.